Where do you stand? Photo credit: DonkeyHotey / WhoWhatWhy (CC BY-SA 2.0) See complete attribution below. Much of the country seems sharply divided. But looks can be deceiving. A big part of the division can be explained by the assumption that you’re either on Team Blue or Team Red. The right is cast as wanting little to no government, while the left advocates for big government. But upon closer examination, this doesn’t hold up: both the left and right seem to want big government; the question is, where? Those not wishing to get caught in this perilous conflict don’t really have a spot on the traditional political spectrum because it only offers a binary choice. Libertarian David Nolan tried to address this issue with the introduction of the Nolan Chart, which uses an X- and a Y-axis to allow people to see where they fit on a more multi-dimensional political spectrum. The X-axis is defined as “Economic Freedom,” where moving in one direction equals more freedom — i.e., towards free market capitalism — the other direction, less economic freedom. The vertical Y-axis is defined as “Personal Freedom” — views on drug prohibition for example — with one direction again equaling more freedom, the other less. A “liberal” would favor more personal freedom than a “conservative,” whereas the conservative would favor more economic freedom than the liberal. While the Nolan Chart appears to be an improvement in clarity, critics have pointed out that it has an obvious libertarian bent. Imposing less regulation and fewer controls, and letting the “free market” reign, is made out to be an increase in freedom, whether economic or personal. And who doesn’t want more freedom? But critics could argue that certain government controls and regulations are designed to increase freedom and prevent tyranny. They would say, for example, that public education and health care are an aid to the economy and well-being of the country, or that a living wage for workers is a boon to business, not a detriment. Antitrust laws are designed to increase competition, not deter it. Furthermore, one could argue that an increase in public lands, parks, and highways, as opposed to privatization, creates an increase in freedom and opportunity. There is also a sense in which the axis-divide between economic and personal freedoms appears artificial. When discussing gun rights, is it a personal freedom issue, or economic? Would a laissez-faire capitalist concede that governments should not allow individuals the personal freedom to purchase a handgun? If economic and personal freedoms are described in terms of morality, then we begin to delve into deeper ethical questions. The following videos challenge us to think about politics more deeply, and to break from simple left-right paradigms. Perhaps it’s time to find new ways to frame our political discourse, and move away from easy labels that diminish our understanding. 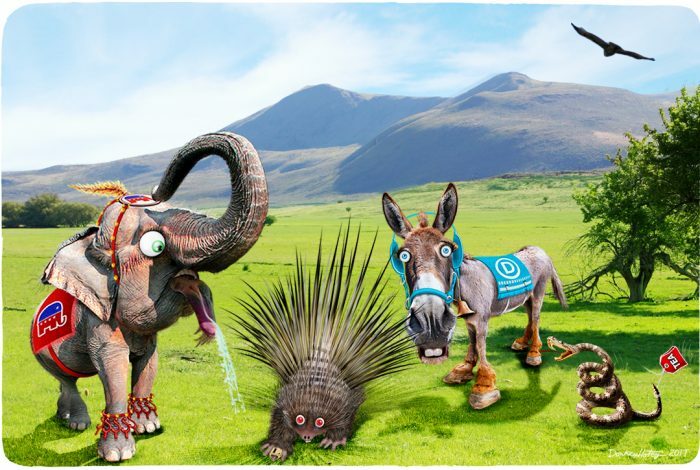 The cartoon above was created by DonkeyHotey for WhoWhatWhy from these images: Porcupine (DonkeyHotey / Flickr – CC BY-SA 2.0), Donkey and Elephant (DonkeyHotey / Flickr – CC BY 2.0) and snake (DonkeyHotey / Flickr – CC BY-SA 2.0). Related front page panorama photo credit: Adapted by WhoWhatWhy from chart (Stannered / Wikimedia).